Murder by Gaslight: Settling an Old Feud. Rushing into the room, she saw Tanzey and Foran struggling on the floor. 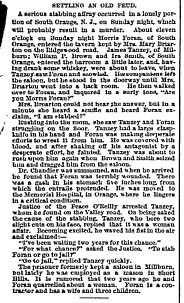 Tanzey had a large clasp-knife in his hand and Foran was making desperate efforts to wrest it from him. He was covered with blood, and after shaking off his antagonist by a desperate effort, he fainted. Fanzey was about to rush upon him again when Brown and Smith seized him and dragged him from the saloon. Dr. Chandler was summoned, and when he arrived he found that Foran was terribly wounded. There was a gash in his stomach five inches long, from which the entrails protruded. He was moved to Memorial Hospital in Orange, where he lingers in a critical condition. “Go to jail,” replied Taney quickly. The prisoner formerly kept a saloon in Millburn, but lately he was employed as a mason in Short Hills. It is rumored that two years ago he and Foran quarreled about a woman. Foran is a contractor and has a wife and three children.